The central Mozambique town of Gorongosa is living on the edge of bad memories. The threats by the Resistência Nacional Moçambicana (Renamo) to revive a civil war that killed up to a million people and displaced five million others is causing fear and suspicion among its residents. Deminers, based in the Sofala province town bordering the high-end international tourism destination of Gorongosa National Park, are a reminder that two decades after the civil war ended its legacy has yet to be erased. Buildings under construction as well as completed, such as the new fresh produce market, are indicators the town is emerging from its post-conflict malaise - but it is a confidence questioned since the decision by Renamo leader Afonso Dhlakama to withdraw from the peace accords signed with the ruling Frente de Libertação de Moçambique (Frelimo) government in 1992. The recently resurfaced 70km road north to Gorongosa from Inchope – which lies on the east-west axis of the strategically important Beira Corridor connecting landlocked Zimbabwe to the Mozambican port city – is now dotted with army patrols. Assault rifles spill over the side of trucks packed with soldiers crouched low in the soft-skinned vehicles, and the odd heavy goods lorry that barrels along the road through the sparsely populated area. In the town the route to the Nhandari river – where women do washing, soldiers bathe and children play – is now a few hundred metres longer since the shortest route was deemed militarily strategic and blocked by a rudimentary bamboo barrier, preventing access to an army post. The Gorongosa area is the spiritual home of Renamo. It is where Renamo launched the 1977 civil war and where Dhlakama recently announced the withdrawal from the peace accords, after the government reacted to several alleged attacks by Renamo forces in the province by routing Dhlakama from his bush stronghold in the Gorongosa mountains. Since Dhlakama and his soldiers – estimated to number from a few hundred to more than a thousand – returned to the bush, hit-and-run attacks by suspected Renamo gunmen in the province have reportedly killed several government soldiers. "The last [civil] war started like this. It was a small war at first and then it just got bigger"
“When they [Dhlakama and President Armando Guebuza] speak, it will finish. If they don’t speak, it will go on forever. When the rains begin [usually in November], the grass beside the road will grow tall and Renamo will be able to shoot [Frelimo soldiers] unseen from right next to the road,” he said. A Frelimo election organizer in Gorongosa, who declined to be named, acknowledged to IRIN that Renamo – created and sponsored by the then white minority-ruled Rhodesia to destabilize newly independent Mozambique, and afterwards by apartheid South Africa when Zimbabwe achieved independence from Britain in 1980 - “does have support”. “That is why Dhlakama [who has disappeared since withdrawing Renamo from the peace agreement] has not been found, as he is probably moving with the population,” he said. The sense of insecurity in and around Gorongosa has prompted population movement from the town as well as into it, but the numbers are difficult to gauge as both security chiefs and the district governor, Paulo Majacunene, declined to speak with IRIN. Antonio Blonde, 58, a farmer in Mucosa, about 12km from Gorongosa, told IRIN that six neighbouring families had left the village to stay with relatives in Gorongosa, and the nearby village of Vunduzi had emptied. This could not be independently verified as the road to Vunduzi has been closed. Blonde, whose wife was killed during the civil war, has a farm with about 300 litchi trees, 200 orange trees, 100 avocado trees and 350 banana plants. He said he would not leave Mucosa although he was “scared” the war could resume. “Every time I come to Gorongosa I have to spend money. In Mucosa I don’t have to spend money, I’m just living off my farm.” He was concerned that if the security situation deteriorated, traders from Gorongosa would not come to the farm to buy his produce and he did not have the means to transport his goods to market. Renamo has been the official opposition since the first multi-party elections in 1994, but analysts say the former rebel movement never successfully transformed itself into a political party and the void is being filled by Daviz Simango, the mayor of Beira, capital of Sofala province, and his Mozambique Democratic Movement (MDM), founded in 2009. The MDM has eight parliamentary seats, Renamo 51, and Frelimo 191. Renamo boycotted the local elections on 20 November 2013. Presidential and legislative polls are planned for October 2014. 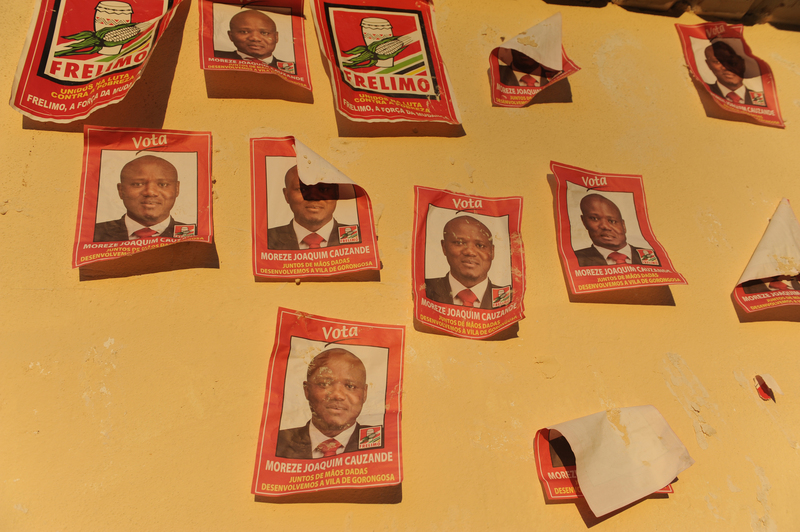 Opposition to Frelimo rule is strongest in the central and northern provinces – the MDM also hold the mayoral seat of Quelimane, the administrative capital of Zambezia province. About 50 percent of Mozambique’s national budget is donor-funded, but an emerging boom in the resource sector is expected to alter this equation. The exploitation of huge gas fields off Cabo Delgado and Inhambane provinces, along the country’s Indian ocean coastline of about 2,700km, and coal deposits in Tete Province’s Moatize Basin, all in the central and northern regions, could bring enviable wealth. Even among Frelimo supporters in Gorongosa there are grumblings that all the revenue from the hydrocarbons industries is being funnelled to Maputo, the national capital located in the south, and “all the mining companies’ head offices” are there too. “Beira has a port and an airport, just like Maputo, so why can’t they [mining companies] work from there,” a man campaigning for Frelimo said to IRIN. Some analysts have speculated that Renamo’s return to the bush is more a consequence of being excluded from the country’s burgeoning mineral wealth. According to an August 2013 report by the South African Institute of International Affairs, A Boom for Whom? Mozambique’s Natural Gas and the New Development Opportunity, the anticipated mineral bonanza could be in its infancy. "Renamo [soldiers] will use one bullet and one is dead. Frelimo [soldiers] will shoot all the leaves off a tree"
There have been no reported attacks by Renamo on mining concerns or their employees, but such operations are seen as vulnerable. The heavy security presence is failing to put people at ease and there is a belief that although Renamo soldiers maybe ageing, they have “experience of war” and are seen as more proficient soldiers with an intimate knowledge of the region, while “Frelimo soldiers come from Maputo, Beira and Nampula [capital of Nampula province]. They don’t know Gorongosa,” Francisco said.